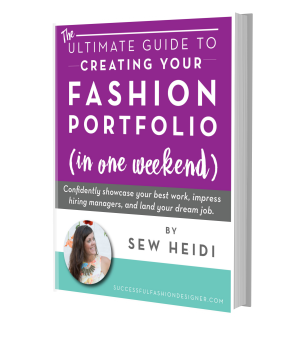 One of the things I discovered when researching this book and hearing challenges and frustrations from hundreds of fashion designers is that a lot of you want some sort of outline or fashion portfolio checklist. In a way, I was surprised that there was so much desire for this, but in a way, I guess it makes sense. The problem is, it’s a tricky thing to solve. Each person’s fashion portfolio and what it does / doesn’t include is going to vary depending on your design process and strengths. Again, this is an art, not a science my friends! Another thing you wanted? Fashion portfolio examples. 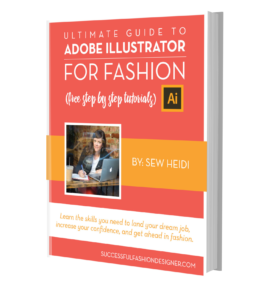 Now listen, there are soooo many examples out there on Pinterest and other sites, it doesn’t make sense for me to fill this book with loads of fashion portfolios from other designers. With that said, I’m going to do my best to give you what you’ve asked for. We already reviewed this in Chapter 5, but to make your life a little easier, I’ve created an abbreviated checklist version you can use for each project. 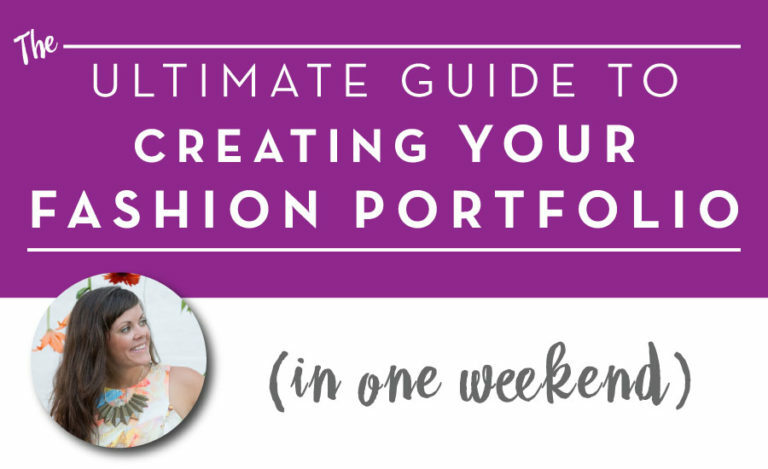 Drop your info below for instant access to the portfolio checklist AND the 73 free (or cheap!) trend forecasting resources 👇. It will help you make sure your portfolio is complete and that you’re not missing anything for that important interview. 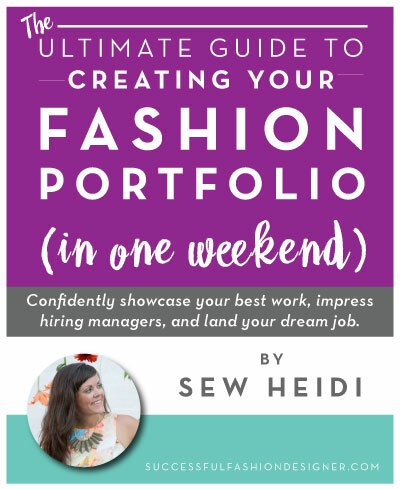 I’ll also send you a PDF of the book so you can save it and read anywhere, plus the Bonus Chapter: 73 free + cheap trend forecasting resources. I’ve never seen anything like it in our industry, and there are some really unexpected places you’d never think of! 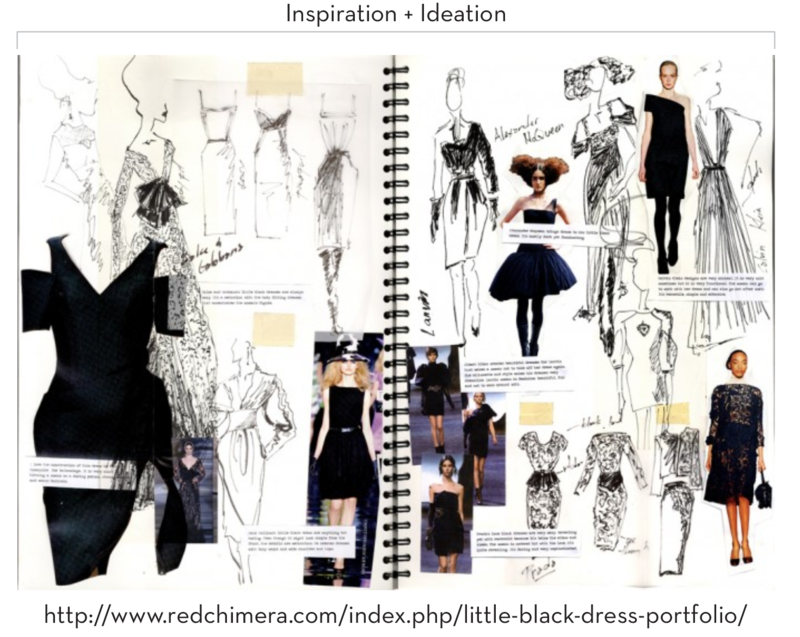 So, to start the process, begin with gathering the relevant documents / files from the above fashion portfolio checklist for the project you want to layout. Now, I know you may get overwhelmed by this. Chances are, when you think of including all the steps from boards, hand sketches, black and white, and colored flats it all gets to be too much. Maybe you want to give each look its own page so things aren’t all jammed together. And you just can’t seem to strike a balance of too much (too detailed) or not enough (too vague). I get it. It’s a lot to digest. This is your job. You are a fashion designer. You have an eye for detail, you know how to edit, and you know when there are too many things fighting for attention. Sit up tall my friend, and take that strong designer eye of yours and apply it to your portfolio the same way you would apply your skills to any other design. When should you add one more thing? When should you take something away? I am not looking at your individual fashion portfolio, so I can’t give you an answer. But you. YOU. YOU have the answer. You know more than you think, and you have a good eye. Be confident that you can do this and use your best judgment. And as always, does it pass the Portfolio Golden Rule? That will always give you your answer. Once you’ve figured out what to include, you may be stuck on the best way to lay it all out. Honestly, everyone’s process is going to be so different, and it will vary for your digital book vs your physical one. 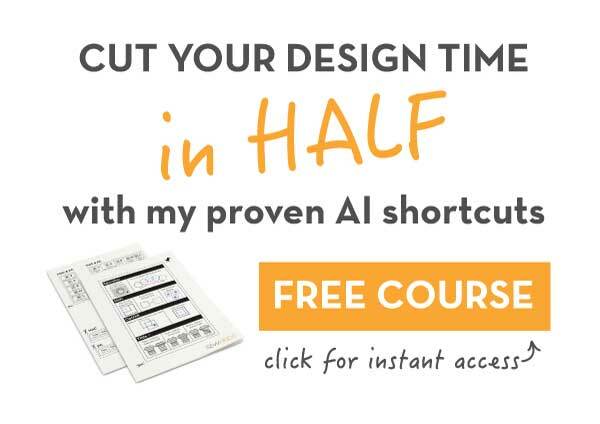 You may start by “wire-framing” out a few layout options on paper. You may print everything out and put it together paper doll style. You may start by pushing artwork around in an Illustrator document (that’s where I’d begin). Choose the medium that you’re most comfortable with and run with it. Just like how you approach designing a collection, every fashion designer has their own method. There’s no right or wrong way to do this. But to give you some layout ideas and inspiration, let’s look at a some work from other people. I particularly like this one by Faye Tilbrook for a few reasons. First, it’s not overly conceptual. It’s commercial (like most brands) and very easy to see where her ideas came from. 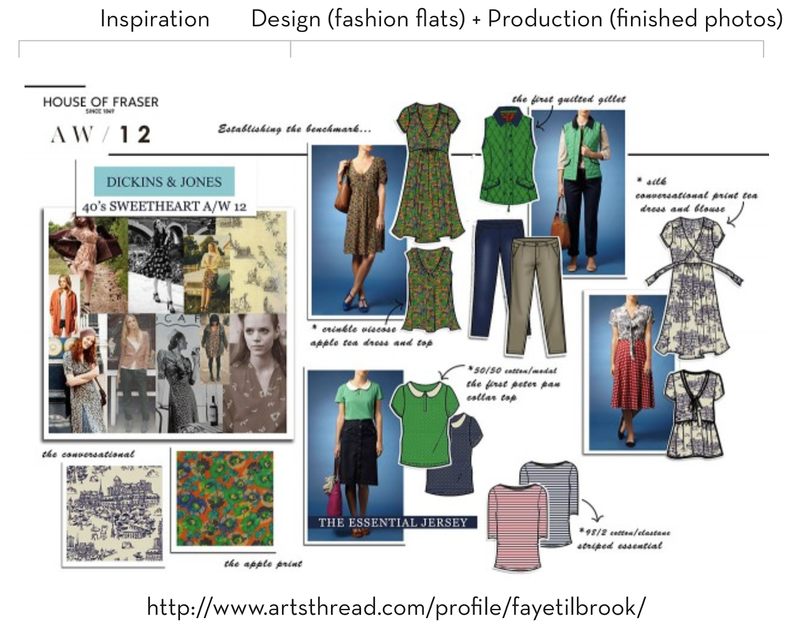 I love the way she collaged the flats with the finished product photos, and added some text callouts. The only thing I’d like to see more of is the color palette inspiration. It looks like the prints drove it, but I would like to see a few more supporting photos for color. This layout by Samantha Dover is also really strong. We see where her inspiration started, and I like how she incorporated the watercolor floral print behind the photos. Her illustrations are strong and really show who the customer is, and it’s easy to interpret design details on the flats. This next one by Ryan Cruzado G. Gangan shows a great example of how to include pages from your sketchbook. 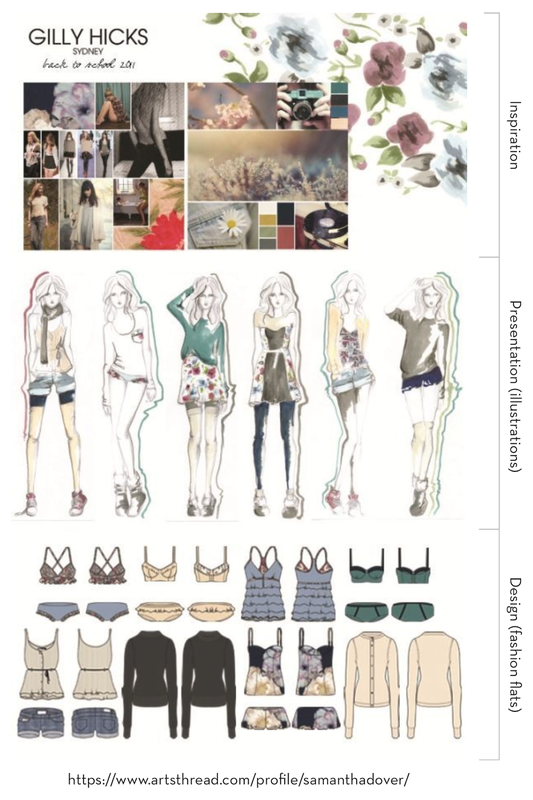 I would want to see digital (Illustrator) flats of what the designs turned into next, but I chose to show it because even though the sketches aren’t “perfect” illustrations, they really convey the inspiration process this designer went through. It’s a great start to the Process Portfolio. Last, I’ve included an example of my own work. I picked this layout for a few reasons, but the main one being that that is for a single design. 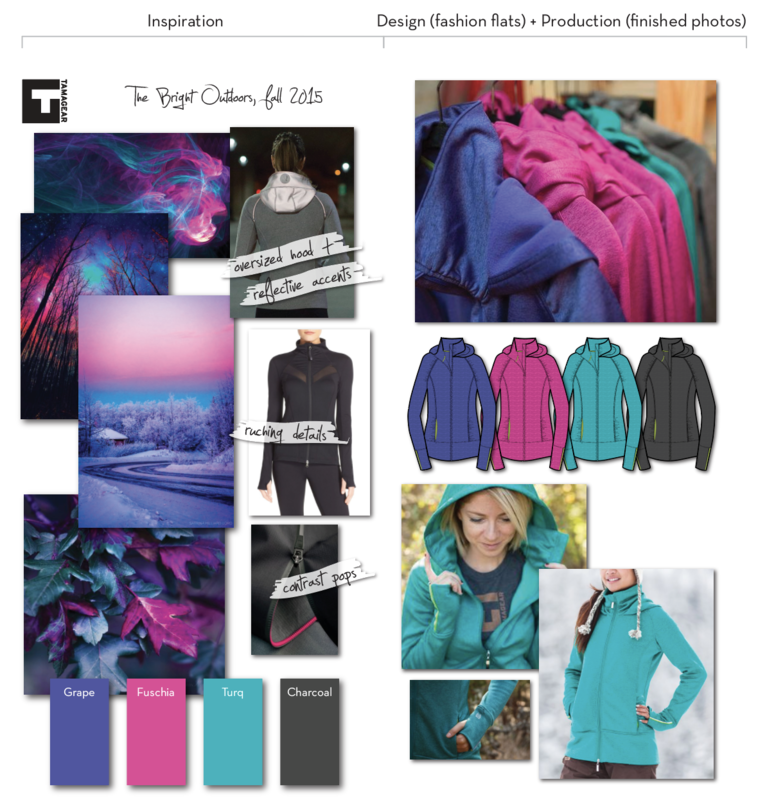 I’ve done a lot of work for brands where we develop key items instead of full collections, so I wanted to show how you can share this in your book. Also, if you look closely, you’ll notice competitor (LuluLemon) product in the inspiration. Notice the variation in these layout examples. They don’t all go in an exact “order”. They don’t all include sketchbooks or production photos. Some are more artsy, some are more commercial. So, use this inspiration, your imagination and design eye, and put something together that will speak to the brands you’re going after.